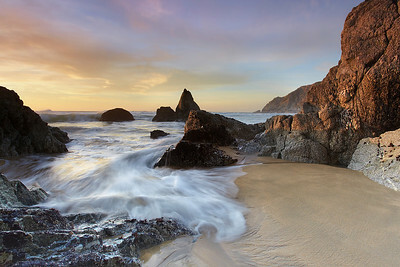 stretch of the California coast with endless opportunities for some good landscape photography. This beach is about 10 minutes south of Pacifica. It is an easy drive and a less-easy place to approach. It is surrounded by cliffs and the parking lot is across busy highway 1. Fortunately there is a nice set of stairs which provide a nice workout on the way back up with no danger whatsoever. The soft golden granite sand is perfect for walking and photographing too. Here is a view down the beach looking south as low fog slides under a brilliant red sunset in the high clouds. 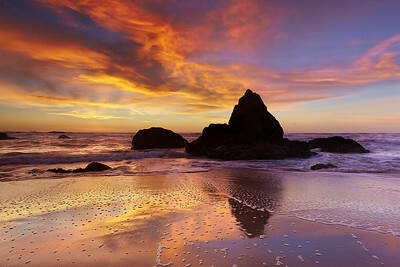 This is the view just before I made "The Monolith at Grey Whale Cove 1 and 2." A low tide at sunset during the winter time is the only time when this view can be seen. Usually this is underwater and large waves pass through submerging this place under 5-10 feet of water. I've been waiting a long time to capture this scene. A low tide at sunset during the winter time is the only time when this view can be seen. Usually this is underwater and large waves pass through submerging this place under 5-10 feet of water. I've been waiting a long time to capture this scene. The second in the series. A low tide at sunset during the winter time is the only time when this view can be seen. Usually this is underwater and large waves pass through submerging this place under 5-10 feet of water. I've been waiting a long time to capture this scene. 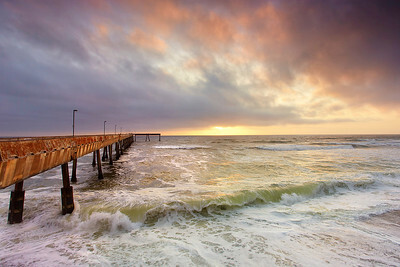 The Pacifica Pier is a great place to watch a sunset. Even on a clear day, there is often a bit of fog here making for dramatic sunsets while elsewhere it is just another bland sunset with blue skies. 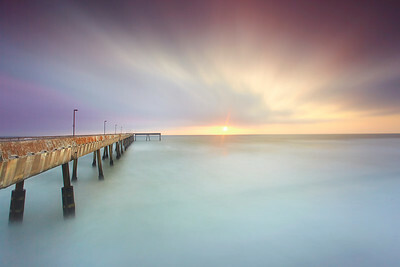 A dark filter allowed me to make a 90-second exposure during a bright sunset. The fog was streaking by in a very dramatic way so I want to show the motion. A continuation of a series showing the sea with little else, viewed from high above with dramatic light. 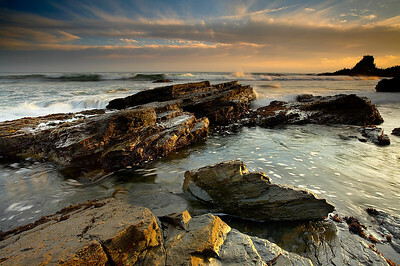 I have set these aside since I usually shoot close to the waves and rocks. But a higher view can be interesting too! In the distance is Mt. Tamalpais and Marin County. 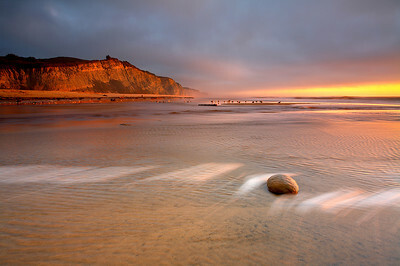 The sunset was turning a brilliant Red during high tide at (the other) Pebble Beach, south of Half Moon Bay. Then a bank of fog moved in to turn this scene into what a seascape may have looked like hundreds of millions of years ago. Or, possibly on some alien world, this is a common sight! Actually it is just alternating layers of red and blue tafoni sandstone. 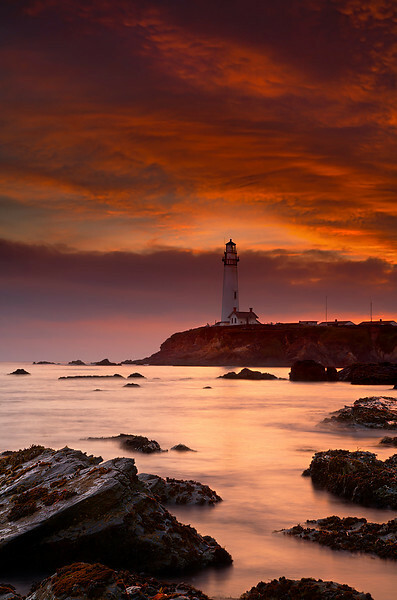 Pigeon Point is home to large numbers of pelicans year round. It really should be called Pelican Point. 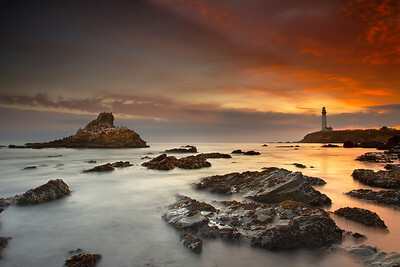 As the sun set, the sky began to glow, but that alone is not enough to make a good photograph. I noticed that the water had become calm and the light enhanced the color of the water. I decided to use a long exposure to define and accentuate the rocks in the foreground. 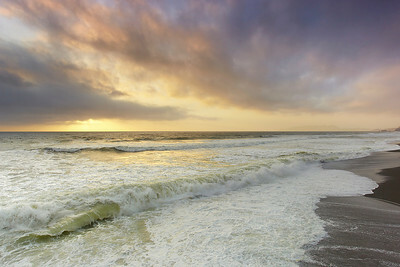 This reduced the distracting motion of the waves while the glow was retained. There are other times, however, when showing the motion of the water is the better choice. San Gregorio beach is a great place to watch the sunset. This was taken as the first storm of the season caused the water in the river to breach the sand dunes and flow to the sea. Bubbles of sea foam made a line in the sand as the last light came through the fog. 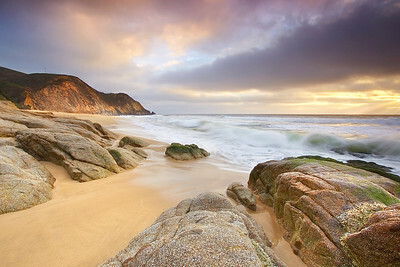 Before taking out the camera and tripod from the backpack, it is a good idea to study the beach and how the waves interact with the rock and sand. Choose one or two favorite places to emphasize, where the water motion grabs your eye. 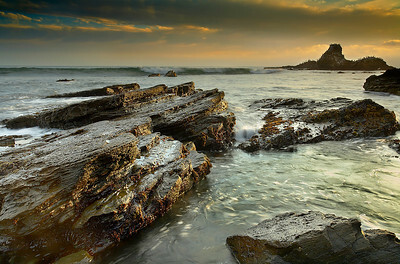 Here, I liked the curl of the distant waves as well as how the water flows over the foreground rocks. So I waited for both events to happen at the same time. Eventually it did, but I had to be hit by a few waves while I lifted the tripod above my head. 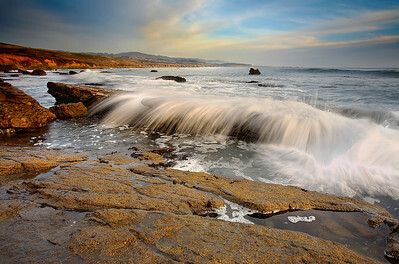 This rocky coastline south of Pigeon Point is the perfect place for Pelicans to sit and watch for fish. They come and go all day and make dramatic plunges into the ocean when they spot their dinner. I had to wait quite a while for the right combination of wave and light in order to show this place off at its best. Notice how the foreground rock is completely wet? 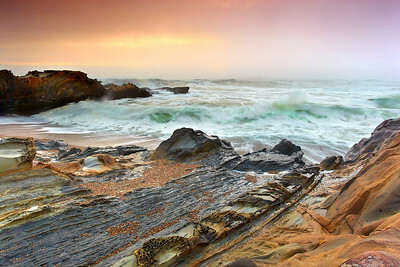 Several times, I had to grab the tripod and run, as one wave after another pounded that rock. I also had to wait for a background wave that was big enough to break in a nice curl, but not so big as to block the ocean's horizon. 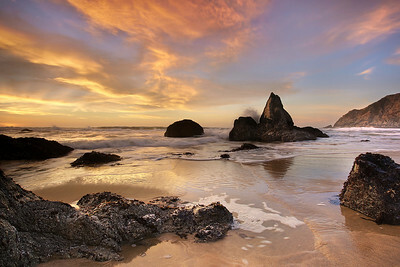 This beach just south of Pigeon Point is full of interesting rock formations. These rocks have been carved by waves like the one shown here. I watched the beach for 20 minutes, looking for interesting wave patterns and this was the best of them. So I set up the camera and tripod and waited for just the right moment. I like how quiet the water is in the pool just before it is to be hit by the wave. After doing a landscape version of this scene, the upper part of the sky began to glow. So a portrait mode was the way to go. I still wanted to keep some rocks in the foreground for balance. I had to wait for the waves to calm down so that a 5 second exposure was enough to smooth out the water.